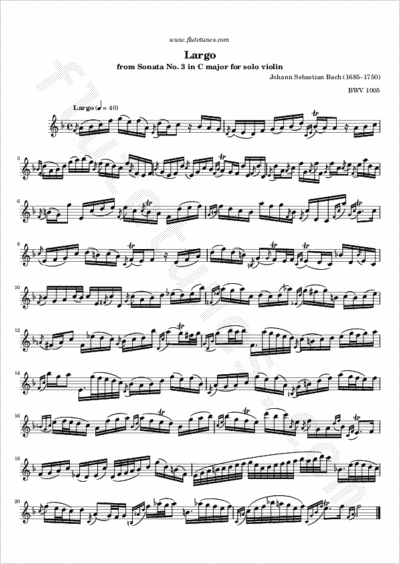 The Sei Solo – a violino senza Basso accompagnato (“six violin solos without bass”), as Bach titled them, have a great historical significance, as they firmly established the technical capability of the violin as a solo instrument. The set consists of three sonatas da chiesa, in four movements, and three partitas, in dance-form movements. It was completed by 1720, but was only published in 1802. Even after publication, it was largely ignored until the celebrated violinist Josef Joachim started performing these works. Today, Bach's Sonatas and Partitas are an essential part of the violin repertoire, frequently performed and recorded. This splendid Largo in F major constitutes the third movement of Sonata No. 3 in C major. Considered by some as the most beautiful of all solo works ever written for violin, it has always been an obvious choice for an encore at any performance.